Amalia, those little animals are adorable! I love them and so creative!! Ariel has his own little zoo to play with! He is so cute...I love that hair!!! Hope you week is off to a great start! Love and hugs! Hello, your nephew is a cutie. Sweet boy! Cute animals and story. Wishing you a great day and a happy new week ahead! Love yours poems and all you make, sooo cute and this boy is sweet and a cutie :) hugs! Oh cute! And I am sure this handsome nephew of yours loves his critters and the poem. What a great idea to include them in a child's play! I've now been to your pinterest, Maya. It is a magical land, I was lucky to find my way out. The animals and poem are adorable. Your nephew is a cutie too! Precious time with your cute nephew!Lovely poem and pretty animals!Hugs! What cute little animals and your nephew looks like he enjoyed playing with them. Love the poem. The paper roll animals are so cute and the poem is delightful. Dear Amalia, have you ever though of creating a book of your poems? I know it would be very well received! 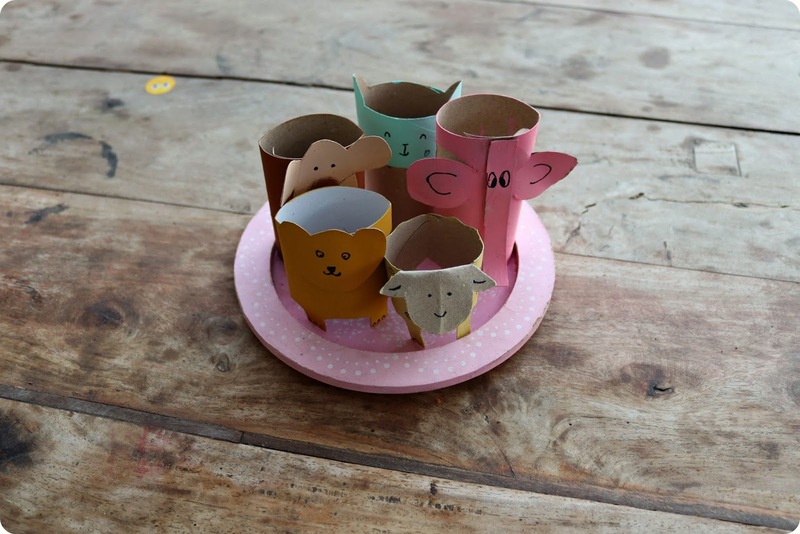 The paper roll animals are a delight and perfect for story time with little ones. Your nephew is so cute. I like the paper animals, and love your verse, Amalia! I can’t believe how fast Ariel is growing! Such cute animals and a very sweet nephew. Ariel must love spending time with Auntie Amalia. Your poem reminds me of our American political situation! And Ariel is absolutely beautiful -- and you can tell he is enchanted by the animals! Your sweet animals and poem just brightened my morning! Thank you! So sweet and Ariel is beautiful! Your posts make me glad to be alive and enjoying the world I live in. Your animal craft and the poem... are so delightful. And your nephew is a darling! Wishing you a wonderful week ahead, Amalia! This is above and beyond, Brenda. Thank you! I love the poem and it looks like your nephew loves the animals! Your nephew is so sweet! I know he is having so much fun with the cute animals! Always love your poems, too, Amalia! What I love most is that curly hair on your nephew, so handsome!! Nice poem! And Ariel is a beautiful name. My grandpa's name minus "l". Love your poem, love your animals and your nephew Ariel is adorable. Oh your darling rhyme is the cutest!!!! 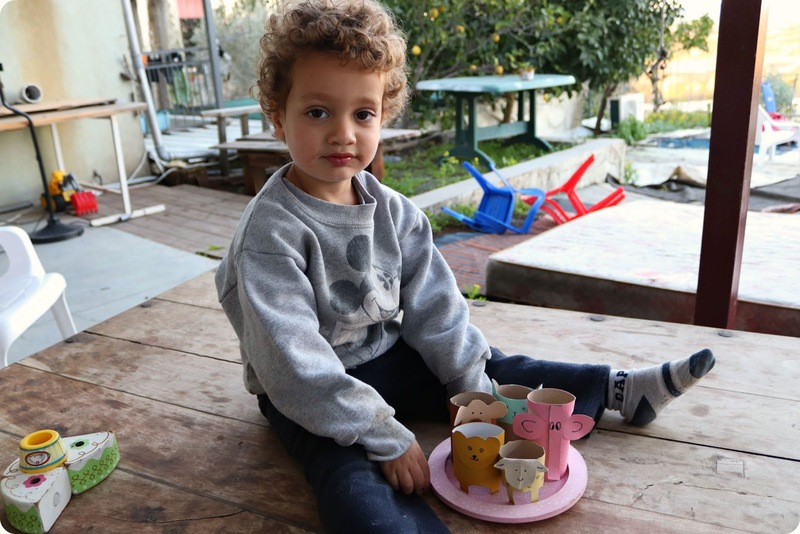 I just love the pictures of the sweet little boy playing with all the fun animals you created! You really should write a book with all your rhymes and darling pictures! What a beautiful gift for your nephew! So creative and such a simple and affordable set of toys. I love that you re-use and recycle materials. You are also indirectly teaching your nephew how to be resourceful. Toys like these stimulate the imagination and are very good for children's development. As usual your poetry is whimsy and wonderful. This is kind, Jodie, and yes - recycled materials are my favorite way to craft. I don't know how you do it! A simple craft, that would take me hours, and the animals unrecognizable. A poem that reads like it just slipped easily out of your mind but that I know is genius in its simplicity. And that innocent look your camera captured on the nephew blessed with curls and an imagination equal to entering the world of giraffe, lion, frog and dinosaur. Adorable--the figures and the poem AND your nephew. They are adorable and so is he! Precious poem and animal figures!! Ariel is a beautiful child. This poem is so cute, Amalia! :-) I love it! It's always such a joy reading your poems! Those paper roll animals are really pretty, and your nephew is so sweet! Your animal cup/napkin(?) holders are priceless, Amalia! Your poem made me laugh - isn't it just the same with people?! Your nephew is really growing - and those big eyes:):) Thank you for sharing these lovelies with All Seasons - much appreciated:) Have a stunner week! I never thought that they could be used as napkin holders, a clever idea, Jesh! Cute paper animals and nice story! 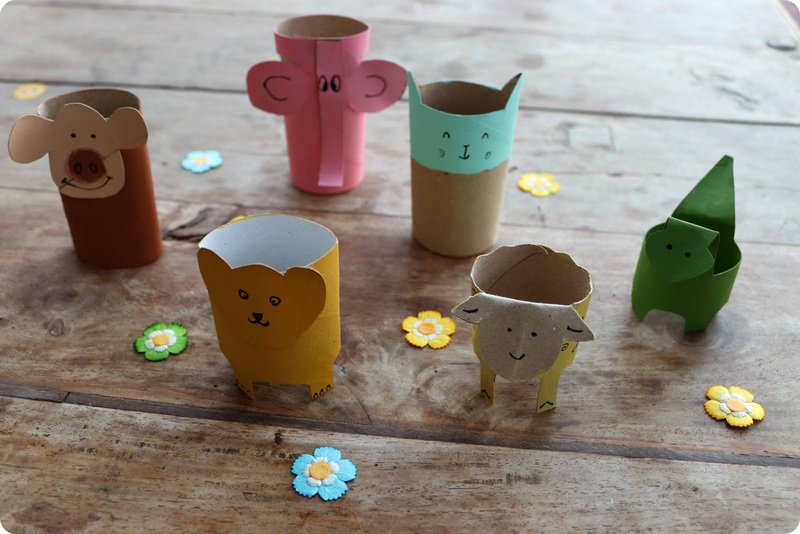 Your little paper roll animals are so cute Amalia. I always enjoy reading your poems. hahaha, I always delight in your poems, Amalia. And what creative little paper roll animals you made. Francesca would love these. I smiled when I saw your nephew's hair. I can totally relate, as I have curly hair too! Such a sweet picture of him. Have been thinking of you - as I read a novel set in Tel Aviv. These paperroll animals are so lovely! Your nephew is so cute! Thanks so much for stopping by and for your kind words about my post on my Dad!! Very cute little critters and I love the poem. How adorable are these cute little guys?? And that poem, just SO cute! ...these bring back fond memories of my childhood many years ago. Thanks! Thank you for your lovely comment on my post. Indeed I made too some toy from paperrolls... it’s funny. I love this Poetry too. Your nephew is a cutie. Love the animals you've made and your poem. These little critters made me smile! How cool and fun! So sweet Amalia, your nephew is adorable! Love the little animals. Those are so cute. Love the animal craft and your poem! Ariel is beyond adorable ! It is amazing that all you need is something so simple to entertain a child! Oh, your little critters made me smile! So sweet ! I like the little green one. Que gracinha!! Ele gostou muito. Those curls! Such a lucky young man to have such a talented aunt! these cute little animals are fabulously made!!! and thoroughly enjoyed your cherished poetry along ! 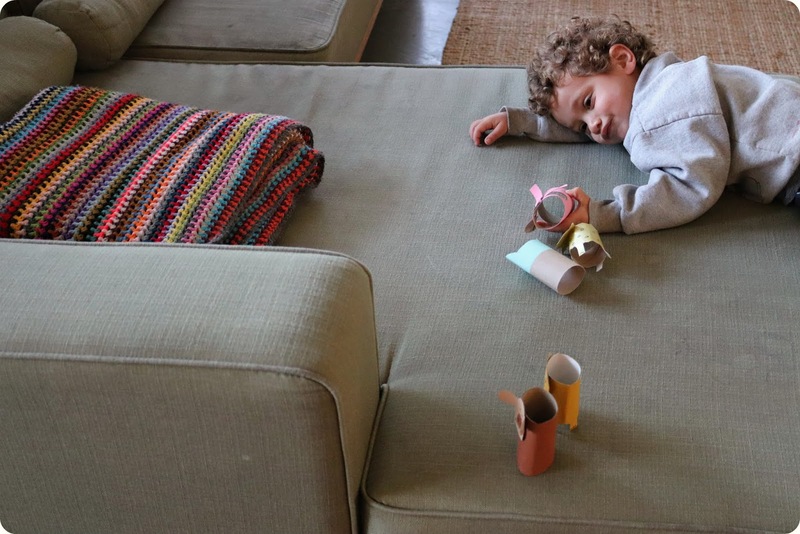 The paper roll animals are totally adorable, and you are, too! I love everything you post here, Amalia!